Congrats PMQG for getting the opportunity to show this quilt in the Michael Miller booth at Quilt Market last weekend! It looks wonderful next to Elizabeth Hartman's Neon Honey Quilt! Amber Wilson, your illustrious PMQG secretary pieced the top and the back, Kim Lumapas, your dedicated PMQG programs director attached the binding, and PMQG Business member and 2012 PMQG treasurer, Nancy Stoval of Just Quilting quilted it! We have two more neon quilts in progress and can't wait to bring them to show and tell. You should all be VERY proud of your work! This was a challenge that was a bit daunting for most of us and we did good! The Michael Miller crew was delighted and asked us to participate in another challenge. Stay tuned for more info on that! October is in full swing! For us quilters, it also means that Angela Walters is coming to our PMQG meeting! We will be meeting in the Stagecraft building at 7pm, don't forget to bring your amazing Michael Miller Stripe Challenge project! I was given the opportunity to read & review Angela's first book "Free-Motion Quilting with Angela Walters." First of all, I've always been intimidated by free-motion quilting, I had the misconception that there were only a couple of patterns that were attainable with my limited free-motion abilities. This book blew wide open that misconception. Angela has 28 designs that are easy to follow and use on our own quilt. 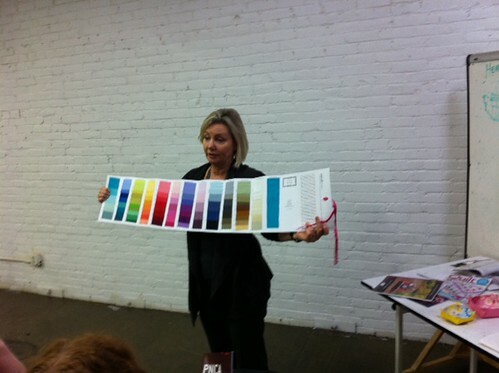 She includes variations and modern alternatives for many of the designs. I love the step-by-step illustrations clearly showing the pattern and offering techniques for execution. Definitely got better as time goes on! That's what Angela encourages throughout this book, practice! I found it extremely fun to just focus on the quilting pattern, rather than piecing. Have you ever done this? Buy the book and try it out! Finally, Angela devotes a few sections to answering the age old question "How should I quilt this?" She also gives many wonderful suggestions for how to best use quilting designs to enhance modern piecing designs. I really learned from this book how much the quilting of a quilt can really enhance the overall design. I'm really excited to put some of these designs to use with my current quilting projects. I'd highly suggest that this book needs to be in your quilting library! Angela is bringing a few copies for sale to our meeting, so if you haven't picked it up yet, you can do so on Thursday night. Also, thanks to Stash Books for giving us a review copy and also a book to giveaway! 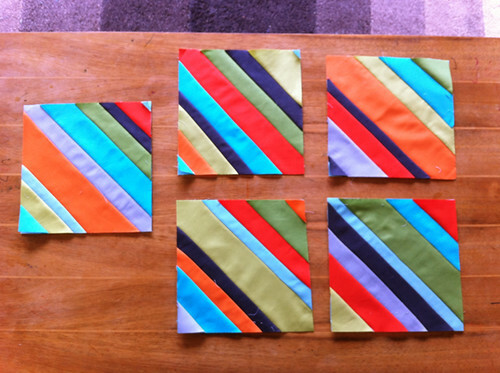 I had so much fun sewing my PMQG challenge block using all the lovely solids Michael Miller sent us! I have always wanted to try string quilting and this felt like the perfect chance to work on something new. Love all the colors together! I wanted to share how I made my block, so if you're interested, you can read on for a simple tutorial. 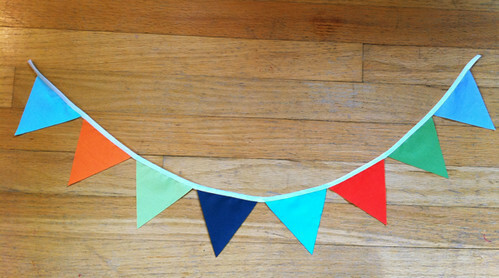 I stitched up a little pennant of the eight challenge colors - Fog, Meadow, Clementine, Luna, Charcoal, Kryptonite, Tangerine, and Aqua. Heather and Petra each sewed improv blocks in the challenge colors in honor of Michelle's wonderful presentation. So, the challenge details are all on the blog, and I was so excited to work with these colors, but the specific block size requirements (15.5" x 18.5") threw me a bit at first. I usually piece square blocks, and rarely anywhere near 18 inches across. But doing a little math, I realized that if I pieced five 8" square blocks and cut one into 2" x 8" strips to sew on both the horizontal sides (using a 1/4" seam allowance throughout), it would magically translate into the correct finished size! 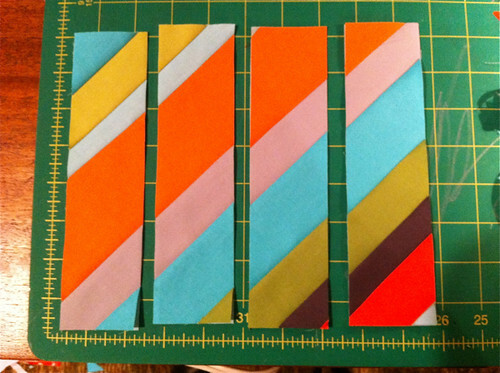 I started by cutting five eight-inch fabric squares for foundation piecing, using an extra piece of Luna (the pale blue solid in the range), and then cut two varied-width strips from each of the 8 colors the length of the fat eighths (22"). 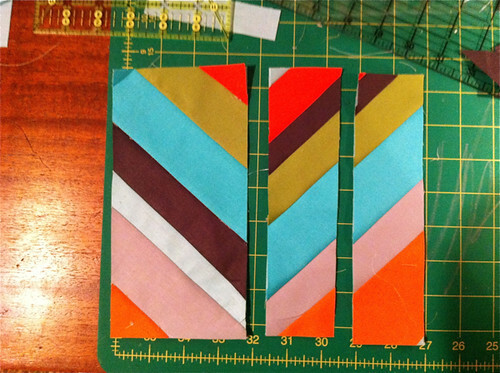 I cut each strip randomly between 1 and 3 inches wide, without thinking about it too much. I made and photographed this block very quickly during one naptime, so I didn't take step-by-step photos of my piecing - for the basics of string quilting, I'll send you to this excellent film in the fridge tutorial. The differences with mine are that I pieced on fabric instead of paper (so don't adjust the stitch length at all, you won't be tearing the back away), and instead of using a glue stick, I just pinned my first diagonal strip in place and stitched the second one on to it, removing the pin afterward, and continuing the same way to fill the square. You'll press and trim the same way as on paper, but you'll have a nice sturdy fabric foundation layer underneath. I loved how much calmness the double layer gave a larger block - Cotton Couture is silky and wonderful to sew with, so it is not heavy or bulky at all. 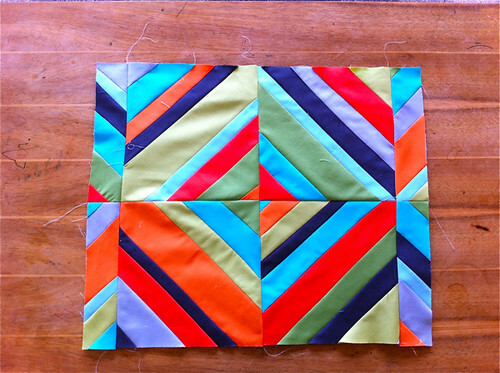 After I made five 8-inch blocks, I stitched four together to form a big, colorful diamond pattern. Then I sliced the 5th block into four 8" tall, 2" wide strips, thinking they would be perfect for adding to the sides to yield that magical 15.5" x 18.5" dimension! ...but I figured out that while they are exactly right size-wise, to continue the diamond pattern, you need two strips with the diagonal going one way, and two with it going the opposite way. Whoops! So I stitched up one more 8" x 4" opposite-diagonal section with the scraps (the one on the left - I had just enough time and fabric left, yay) and cut that one into two strips to use instead. And ended up with this! If you are a PMQG member and haven't gotten your challenge fabric yet, you can pick it up from Nancy at her Just Quilting studio, Monday through Friday. Just give her a call first (503.234.0403). And if you're working on your challenge block, please share photos in the PMQG flickr pool, we'd love to see them! 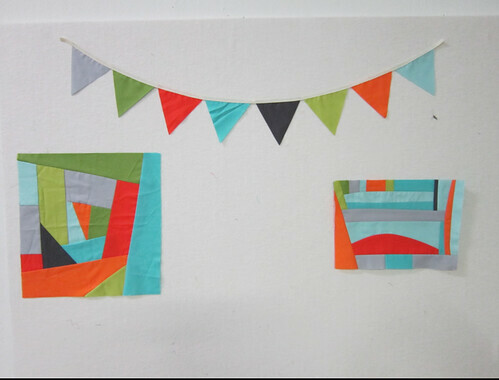 You can bring your challenge blocks to our April meeting (Thursday the 19th at 7 pm, PNCA) or email us at portlandmodernquiltguild at gmail.com so we can collect them and take photos. Kathy Miller will choose 16 of our blocks to create a special Cotton Couture quilt for the Michael Miller booth at Spring Quilt Market! We'll make a PMQG-collective quilt with the others plus any improv blocks using your scraps you'd like to bring in May, and hope to show it in Sisters. March Meeting Reminder & Two Quilting Events! This Thursday, is our March meeting and it's going to be a fun one! We will be meeting again in the Illustration Studio - S1 - in the stagecraft building from 7 - 9pm. The door into the building faces NW13th street, if you come after 7:15, knock or call the number on the door and we will run down and open it for ya! Click on our New Room Info page for a map. You won't want to miss this meeting as we are launching a new challenge sponsored by Michael Miller using their new Cotton Couture fabric! Paid members get to walk away with eight fat eighths of yummy Cotton Couture. If you haven't paid your dues yet, it's not too late! You can renew online by clicking the membership button or in person at the meeting. Your challenge is to make a patchwork quilt block. Here's the basics we'll have more details at the meeting. • Finished blocks should measure 15½” wide x 18½” high. • Blocks should be machine pieced. Any piecing technique is welcome, but please avoid applique, embroidery or other embellishments. • Blocks should be made using only the Cotton Couture solids received at the meeting. Please do not add any additional fabrics. • Have fun! We want to see a block that shows your unique voice. Blocks will be due at the April meeting. 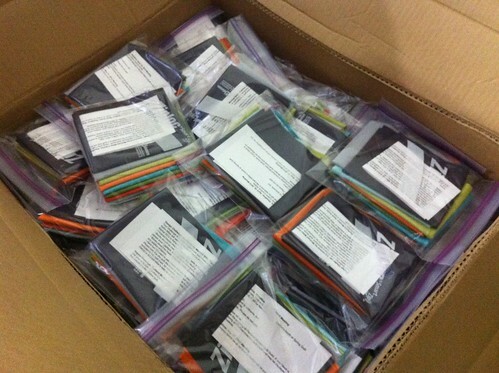 Kathy Miller herself will select 16 blocks to be included in a quilt that will be featured in Michael Miller’s booth at Spring Quilt Market 2012 in Kansas City! Please note that the quilt displayed at market will become the property of Portland Modern Quilt Guild. If your block is included in this quilt it will, by extension, become the property of Portland Modern Quilt Guild and may be displayed on PMQG or Michael Miller’s website or other promotional material. Did you know that this Saturday is National Quilting Day! We couldn't let it pass by without doing something special! Come join us for some shopping and quilting. Meet up at Bolt at 3pm, this Saturday, March 17th for some yummy shopping. Then hop over to Modern Domestic for some sewing/quilting from 4 -7pm. This is a special event just for PMQG! To sign up in advance for the Modern Domestic Sew-In ($10) click here to reserve your spot. Come join us! Finally, PNCA is offering a fabric care and preservation class on March 24 10am - 12pm ! It's only $20, quite a few members have already signed up, but there are a few spots left! Don't miss this opportunity to learn how to best restore and take care of your quilts! Click here to sign up.